To export an image sequence, you need to adjust a few settings in the Write module’s properties. 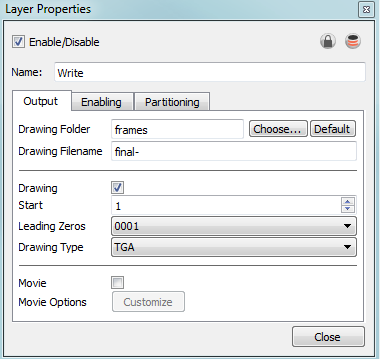 TVG (Toon Boom Vector Graphic) is the Toon Boom vector proprietary format. Select TGA4 to export your sequence with an alpha channel (transparency). Select SGI4 to export your sequence with an alpha channel (transparency). Select SGIDP4 to export your sequence with an alpha channel (transparency). Select PSD4 to export your sequence with an alpha channel (transparency). Select PSDDP4 to export your sequence with an alpha channel (transparency). Select PNG4 to export your sequence with an alpha channel (transparency). PNG4 is the recommended format to export an image sequence with transparency. Select BMP4 to export your sequence with an alpha channel (transparency). Select OPT4 to export your sequence with an alpha channel (transparency). The formats used if you need to output a vector format are TVG and PDF. You can also export a SWF movie. 1. In the Network view, open the Write module’s editor by clicking on its Properties button. 2. In the Output tab, select the Drawings option to create an image sequence. 3. Click Choose and browse to the directory where you want to save the output. ‣ You can also use the default directory to save in the default Frames folder included in the scene directory. 4. In the Filename field, type the image sequence’s name prefix. It is very important to leave the hyphen (-) symbol at the end of the name to separate the image name from the image number. 5. In the Start field, select the starting number for the image sequence. 6. In the Leading Zeros field, select the number of digits you want to see after the sequence prefix. 7. In the Drawing Type field, select the file format you want to output your project to. When the file format includes a "4" at the end of its name, it means that an alpha channel will be created. The project will not start rendering yet, since these are only the settings. You can still modify your scene.